A far-flung tropical paradise that's yet to be touched mass tourism, Isle de Providencia is a place of golden sand beaches, glittering turquoise blue waters, groovy music and bad wifi. Lying between Costa Rica and Jamaica, it is an island far removed from the modern world, making it an ideal tropical retreat. With the world's third largest reef, it is the perfect place to go scuba diving and its beautiful beaches lie in the shade of coconut and palm trees. Idyllic and laid-back, our collection of the best places to stay in Providencia will leave you utterly relaxed. Until 1641, Old Providencia - as the locals call it - was an English colony, and as such the vast majority of its inhabitants are the descendants of slaves brought here by the British. They speak a curious form of English creole much like their neighbour San Andres and the towns, villages and road signs have British words and names. During the Golden Age of Piracy, it was a great place for smugglers and hideouts: it is said that the ruined castle Fort Warwick was once the basecamp of the pirate Henry Morgan during his raids on the Spanish Empire, supposedly hiding a great deal of his treasures on the island itself. With no connection to the mainland and barely over 100 vehicles, Providencia has its feet dug firmly and proudly into the traditions of the past. Indeed, you can spend a whole day on the island without meeting a single fellow-traveller. As you lazily walk the beaches and streets of the island beneath the cooling shade of palm trees, reggae plays in the background (there are a great many Bob Marley fans here) from clubs like Rolands, which have been going for thirty years and counting. One of the real draws is the scuba diving potential: with many shades of blue glistening in the waters, the world's third-largest reef (32km) straddles the coastline and there are numerous diving companies to be found. Crab Cay - A fantastic beach on the North of the island. A great place for snorkelling and a good opportunity to spot a turtle! Manzanillo Beach - with weatherbeaten beach bars, coral sands and coconut palms, it makes for a delightful spot to simply unwind. Rolands - the foremost bar and club on the island, run by the same local for the last thirty years, is an unforgettable experience, full of dancing, reggae and good times. Take a hike through the forest to Morgan's Head. Walk from the statue of the Virgin Mary to this beautiful and secluded spot for a great view of the sea and a terrific place to swim (approximately thirty minutes walking). Visit Fort Warwick, where the pirate Henry Morgan supposedly hid after raiding the Spanish Empire, it is a 17th century ruined castle and fascinating to explore. Hike with a guide through stunning natural trails in the island's central forest, the Peak Forestry Reserve. The way up will take around an hour and a half and although guides are not essential, they are recommended. Felipe Diving Center offers opportunities for both beginners or life-long divers. Get your scuba kit on in this heavenly setting and explore the wonders that lie below while you swim in the world's third-largest coral reef! Whether it's scuba diving in coral reefs, snorkelling with turtles, lounging in a hammock at a beach bar or exploring the ruined hideouts of pirates, Providencia is truly a hidden gem totally unspoilt by tourism and an unforgettable experience: the best places to stay in Providencia will give you a real flavour of island life. Deep Blue is only half a mile from Cayo Cangrejo but you probably won’t ever want to leave! The hotel has it all, king sized beds looking out onto the sea, private terraces with most rooms overlooking the water, contemporary architecture and an infinity pool to top it off. Deep Blue is particularly popular for couples. Our partner Booking.com has a wide range of villas and properties in the area for those looking for something self-catered. Weather wise you can’t really go wrong on Providencia Island. It’s warm and sunny year round, however, the rainy ‘season’ is the month of October when you might get the odd downpour. Getting there is not for the faint-hearted. Fly to Bogota from where one can either fly or catch the ferry to San Andres. From there you can take a 20-seater plane to Providencia or a three hour ride on a catamaran. Either way, getting there is half the adventure. Expand your search to include all our options in Colombia. or contact a friendly guru for advice. 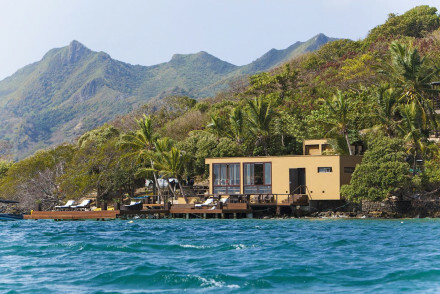 Deep Blue enjoys a waterfront location on Providencia Island. Its rooms are modern and chic with king sized beds whilst most have private balconies with sea views. Relax on the terrace and soak up the sun or go for a refreshing dip in their infinity pool. A truly excellent stay in a lovely spot!